LOVED it. My 10 yr old daughter did too. Well written, and so funny! Timely, what with Russia in the news. Gervais and Fey great. 'Evil' Kermit stole the show. This is an amazing movie. Most of the funny parts were used in the trailer, but still a good movie. Random celebrity appearances, fantastic musical numbers, and funny jokes. This movie is awesome!! I laughed, clapped and had a good time. It was a real hoot! Saw it at the NY Children's Film Festival last weekend. 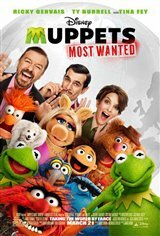 Just a superior sequel, full of wit, laugh out loud moments, whether gag based or character this is the zippy, zany fast bright coloured class A Muppet film we all wanted/Needed! TOOK MY TWO GRANDCHILDREN AND A FRIEND TO THIS MOVIE. THEY LAUGHED THROUGH TO WHOLE MOVIE! THEY WERE ALSO EXCITED .."GRANDMA THERE IS USHER!!!" THEY LOVE HIM IN THE VOICE !! !